With the confirmed good IQ of the large prints, I consider my rolling review of the pre-production 7D Mark II done. It was a joy shooting this latest piece of DSLR technology, which can potentially replace all my existing DSLRs (1D4, 5D3 and 7D) without loss of functionality or capability. 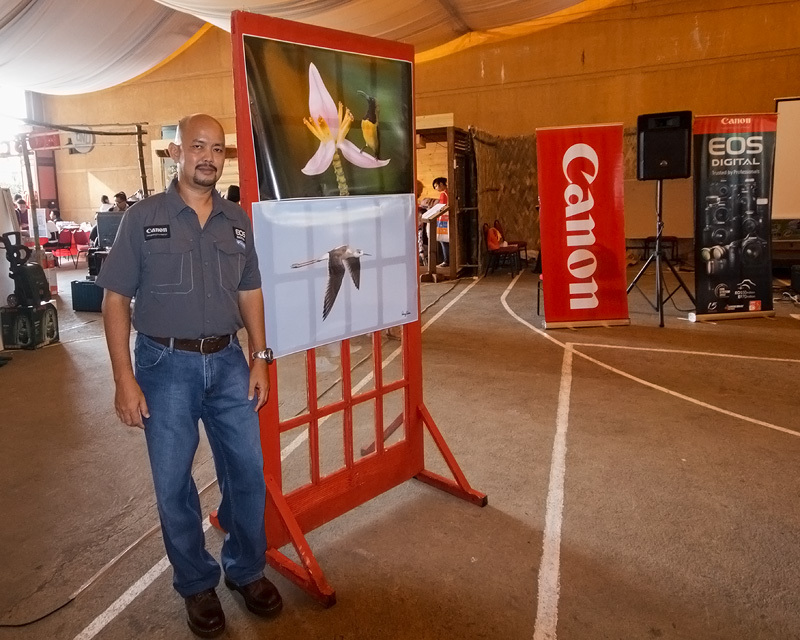 A couple of 24" x 36" prints from the pre-production 7D Mark II were displayed during a photo-workshop I conducted at Baguio City yesterday, October 26th. As I expected, the prints turned out nicely as far as IQ is concerned, even when examined up close. 7D + 10 mm, f/4, 1/50 sec, ISO 1600, on-board flash at -2/3 FEC, hand held. 7D Mark II + EF 600 f4 IS II + EF 1.4x TC II, 840 mm, f/5.6, ISO 1600, 1/160 sec, manual exposure in available light, off-center spot AI servo, 475B/516 support, uncropped full frame resized to 800x533. manual exposure in available light, 475B/516 support, major crop resized to 800x533. Sometimes, the BIF is too small in the frame to make a decent sized print and such shots I usually delete right after chimping, unless the species is a photo-lifer. But if the DSLR used has a good pixel count packed into a smaller sensor like the 7D MII, the resulting high pixel density allows for massive cropping, with enough detail left for small prints or web display. Habitat - Uncommon, in marshes, ricefields, and fishponds in shallow water rarely on exposed mud and coral flats. f/5.6, ISO 320, 1/2000 sec, manual exposure in available light, 475B/516 support, major crop resized to 800x533. I used AI servo, and Case 1. I alternated among 5-points, 9 points and 15 points (all central). I felt that the responsiveness of the AF system seems to be inversely proportional to the number of active AF points used; i.e. the 5-points is most responsive while the 15-points is least (difference in responsiveness is very, very slight though). On the other side of the AF equation, choosing a small number of active AF points might give you a more responsive system, but keeping the small AF area on the BIF is also more difficult. So, one has to balance AF responsiveness vs size of AF net to be cast. 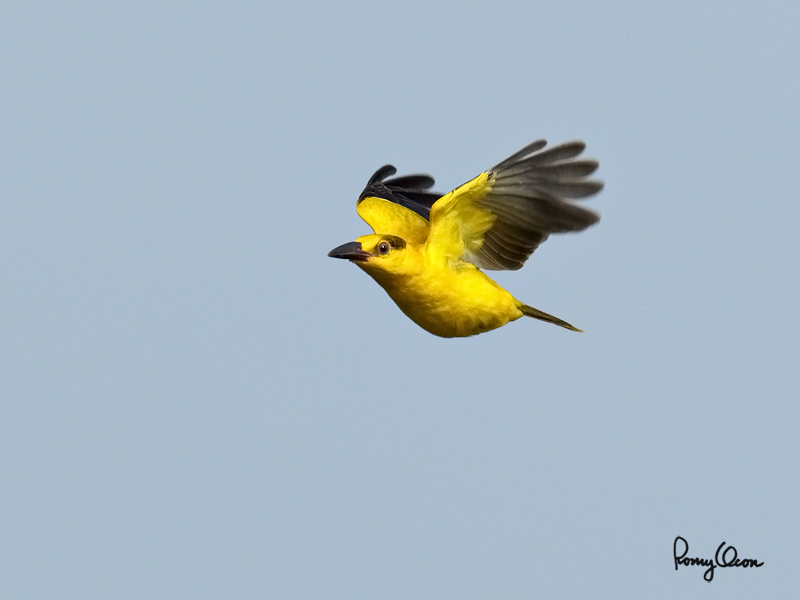 I use 15-points at featureless BG (like the sky), regardless of the color of plumage. 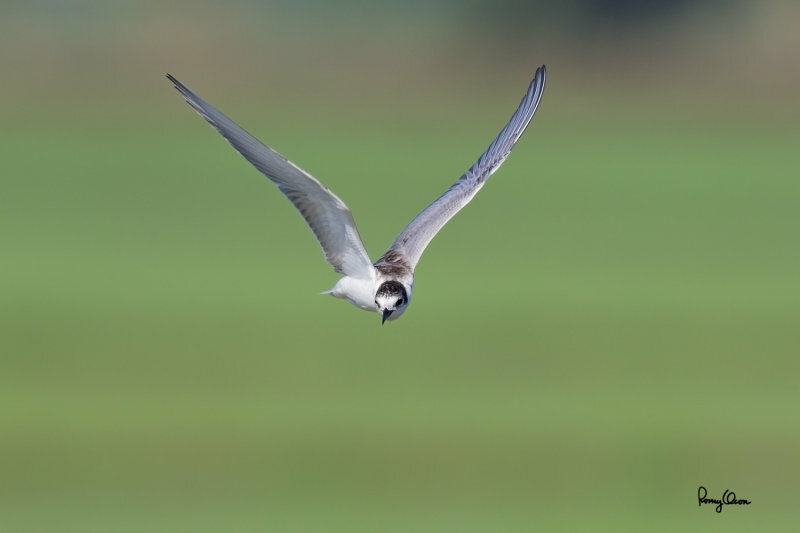 I use 5-points when the plumage is less contrasty and/or the BG is featured (say terrain). I use 9-points for intermediate situations. Note that this AF workflow is a result of only a few days of BIF shooting with the beta 7D MII. Once I get a production unit and spend more time with it in the field, I expect the workflow to evolve further. By the way, there's a very interesting behavior of the 7D MII's AI Servo AF at BIFs that makes it different from my 1D4/5D3/7D. When the BG is featured and contrasty, the 7D MII will sometimes focus first on that. But as long as I kept the AF points group on the bird, the AF system shortly refocuses on the intended subject (nearer to the shooter) and keep it there (as long as I do my panning job well). My older BIF cameras were often near hopeless when the BG was more contrasty than the BIF, especially when the bird is very small in the frame. 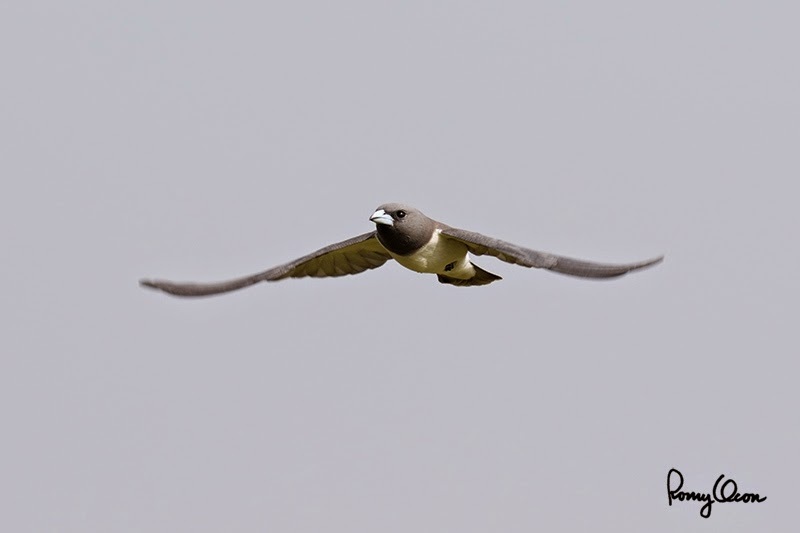 A bird flying towards the camera is a good test of the performance of the AF system of the 7D Mark II. In this particular image, placement of critical focus is right at the head/eye area. 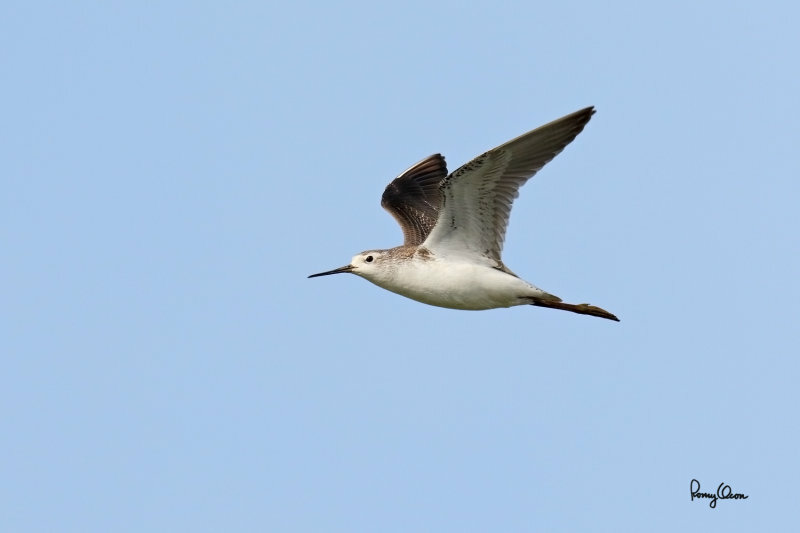 This can be readily confirmed by examining the 100% crop posted below - the tip of bill and the shoulder area are less sharp than the eye. f/6.3, ISO 320, 1/2000 sec, manual exposure in available light, 475B/516 support, major crop resized to 800x640. 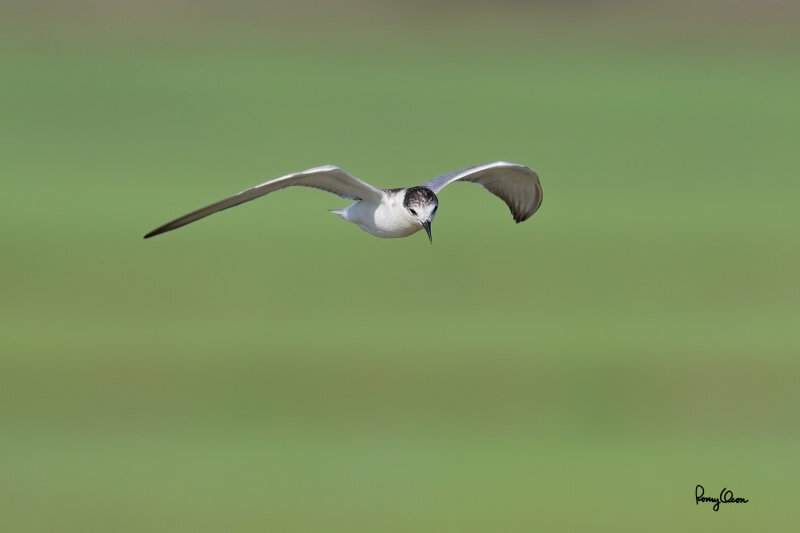 Here's another incoming bird in full speed flight. Again, the 7D Mark II's AI servo AF delivers. f/5.6, ISO 320, 1/2000 sec, manual exposure in available light, 475B/516 support, 6 MP crop resized to 800x533. This balete tree (a fig species) near TREES Hostel at the base of Mt. Makiling was fruiting, and many species of birds were enjoying the virtual feast. 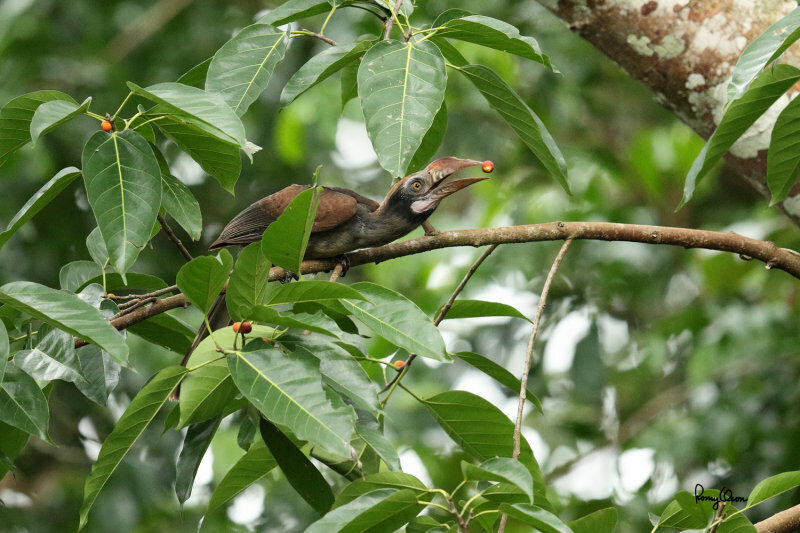 I knew from past observations of this bird's behavior that sometimes it flips the little fruit in the air before swallowing. I prepared my gear for action shooting in manual exposure mode - I took off the teleconverter and opened up the aperture for more brightness, dialed the Tv to 1/1600 to freeze the motion, set the sensitivity to ISO 6400, and selected AI servo AF. I then trained my shooting combo on this foraging female. Sure enough, it flipped the fruit in the air and I let go of a short 10 fps burst. One shot caught the fruit in between the open beak (as I wished for), albeit it would've been better if there was good separation from the upper mandible. With respect to the high ISO used, is there noise in the image when looking closely at the full-res file? Of course, there is. Even my 5D Mark III, with its fat light-sucking pixels, has noise grains at such high sensitivity. But the 7D MII's noise grains are very fine and I reckon this 13.5 MP crop will make at least a 13"x19" print with decent IQ even when examined up close. I couldn't see any banding either. 600 mm, f/4, ISO 6400, 1/1600 sec, manual exposure in available light, AI servo, 475B/516 support, 13.5 MP crop resized to 800x533. 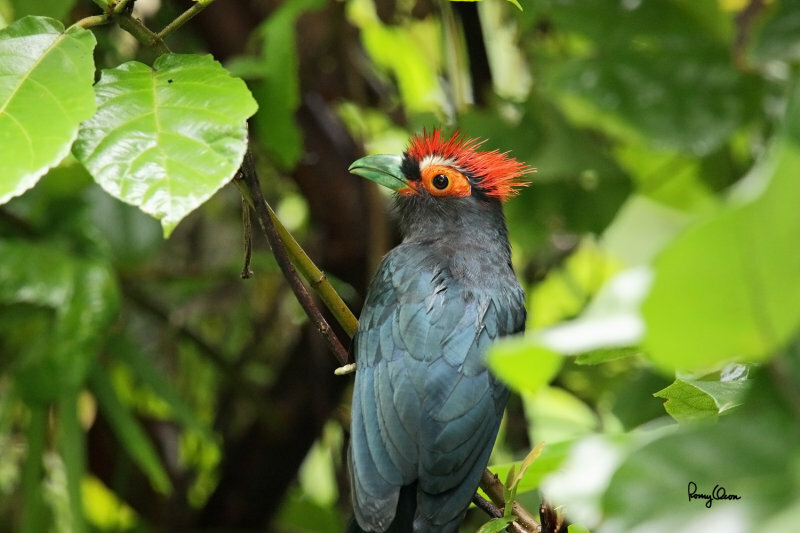 With a total length of about 16 inches, the Red-crested Malkoha (Phaenicophaeus superciliosus, a Philippine endemic) is fairly large, and this shot is one good example of having too long a reach (doesn't happen very often in birding). The bird appeared suddenly in an opening in the understory, hunting invertebrates. It was constantly moving and I had neither the time to take the 1.4x TC off nor the opportunity to walk backwards to frame the whole subject. How I wish I had a 200-400 f4 IS mounted! 840 mm, f/5.6, ISO 3200, 1/250 sec, manual exposure in available light, spot AI servo, 475B/516 support, uncropped full frame resized to 800x533. 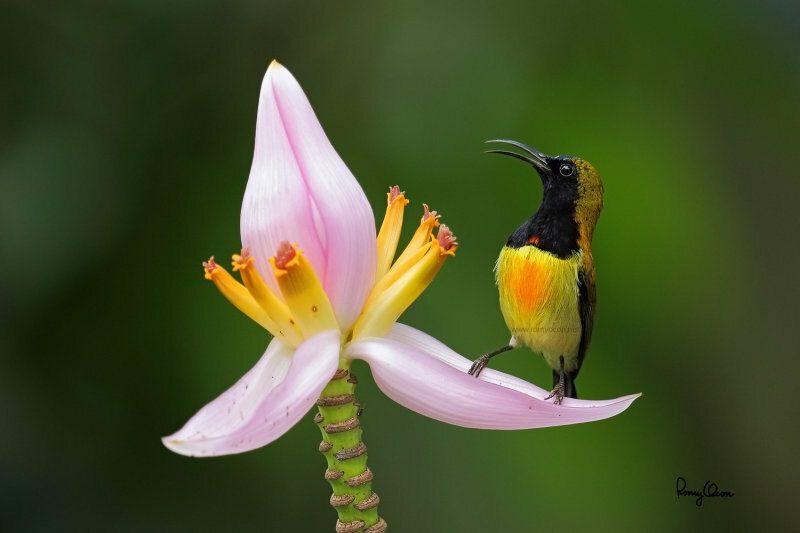 This Flaming Sunbird (Aethopyga flagrans, male, a Philippine endemic) was feeding on a flowering banana-like plant at Mt. Makiling earlier today, October 15th. 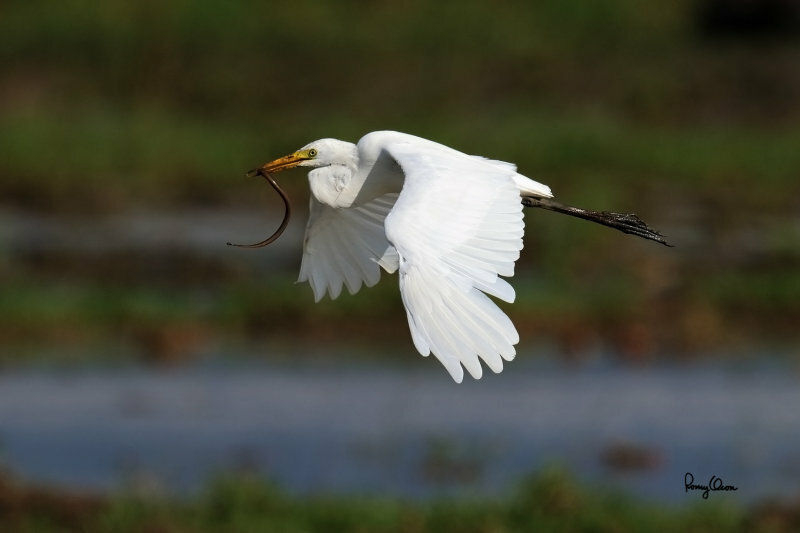 The bird's total length is only 95 mm (3.75 inches). I had to snap on a 1.4x TC to fill the 7D Mark II's frame with the tiny subject. The banana-like plant is located in the undergrowth, plus the skies were heavily overcast, so light was low during the capture. 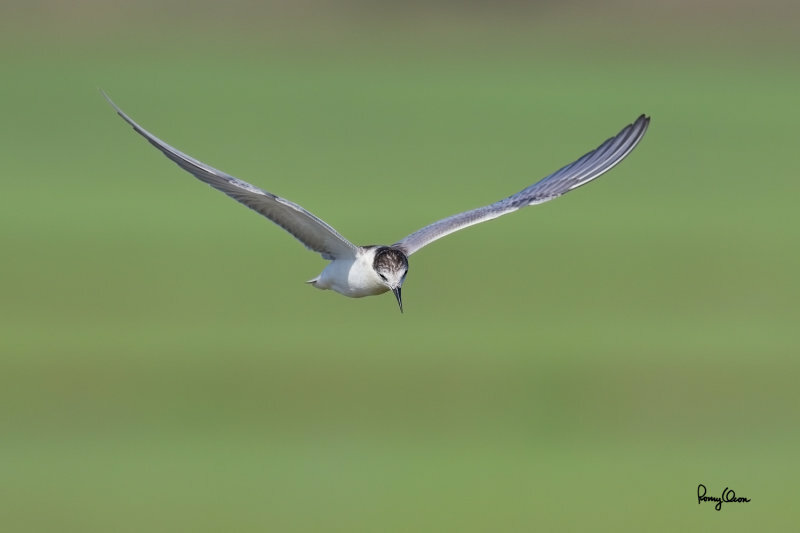 This makes the shot a challenging exposure task - the Tv has to be fast enough to freeze the active bird, but choosing a very high ISO will limit the useable dynamic range (and increase noise). 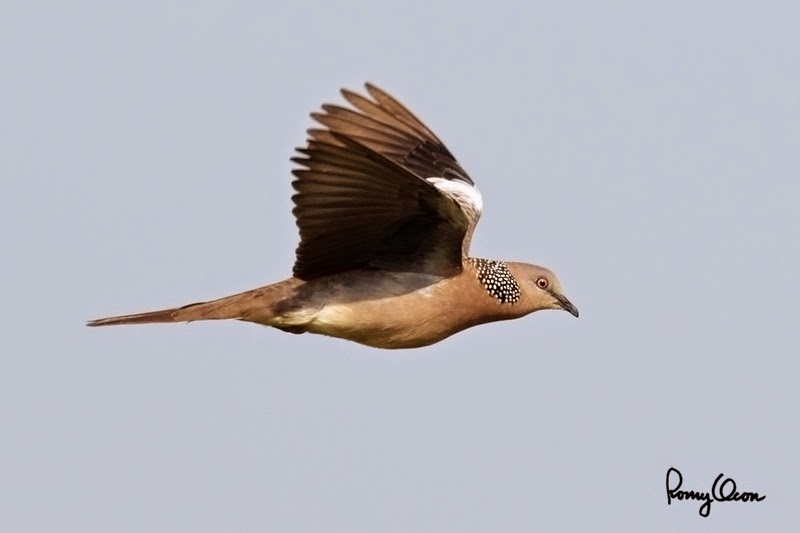 This can cause some problems with the bright flower and the breast of the bird, contrasting with the dark throat. I settled on a slowish 1/160 sec to keep the ISO manageable, and just fired short bursts to increase the chances of getting the bird in between movements. 840 mm, f/5.6, ISO 1600, 1/160 sec, manual exposure in available light, off-center spot AI servo, 475B/516 support, uncropped full frame resized to 800x533. f/6.3, ISO 320, 1/2500 sec, manual exposure in available light, 475B/516 support, major crop resized to 800x533. 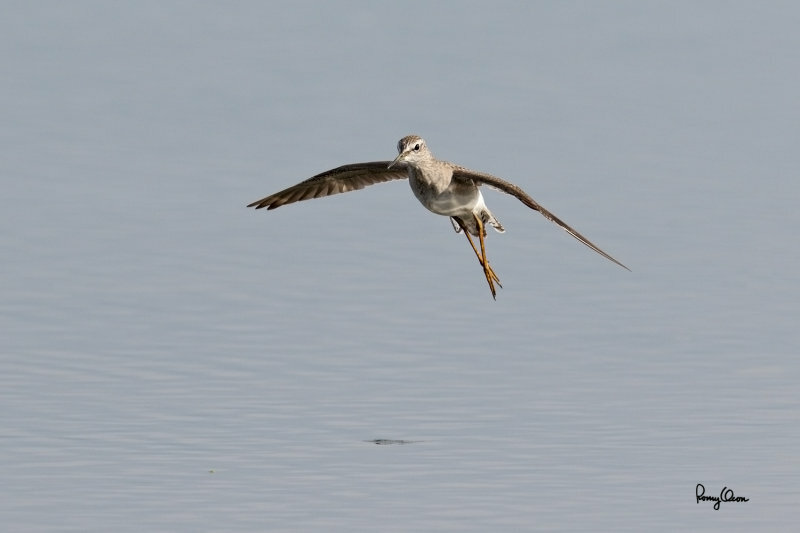 Can a 7D Mark II catch a Dragonfly-in-Flight (DIF)? Ok, so I'm impressed with the 7D MII's AF at BIFs. But then, those are relatively large targets, and they're are not really on top of the degree of difficulty scale as far as subject acquisition and focus tracking are concerned. While waiting for BIFs to appear, some dragonflies hovering over the newly planted rice paddies caught my attention. Would I be crazy enough to try and capture a DIF? You bet I am! I tried hard, and it was really very tough to get the two-inch long critters within the VF, much less nail the focus. But in between gusts of wind, the gods of telephoto action photography smiled and one lucky shot managed to freeze one in mid-air. 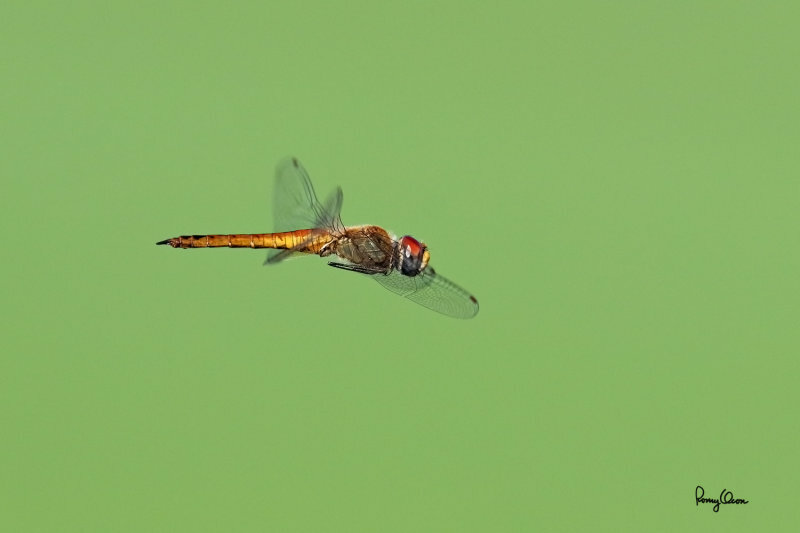 DRAGONFLY-IN-FLIGHT: Candaba wetlands, Pampanga, Philippines, October 13, 2014, Canon EOS 7D Mark II + EF 600 f4 IS II, f/7.1, ISO 320, 1/1600 sec, manual exposure in available light, 475B/516 support. 6 MP crop resized to 800x533. 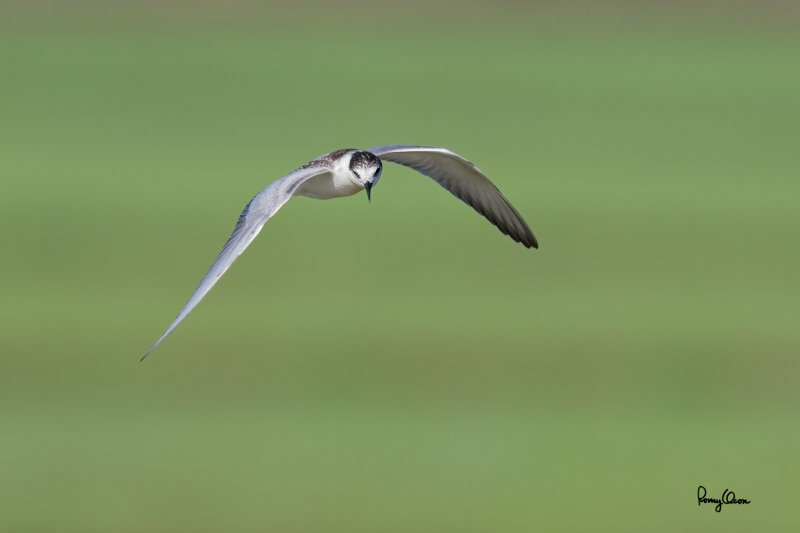 The Whiskered Tern (Chlidonias hybridus) is a common migratory bird in our islands. 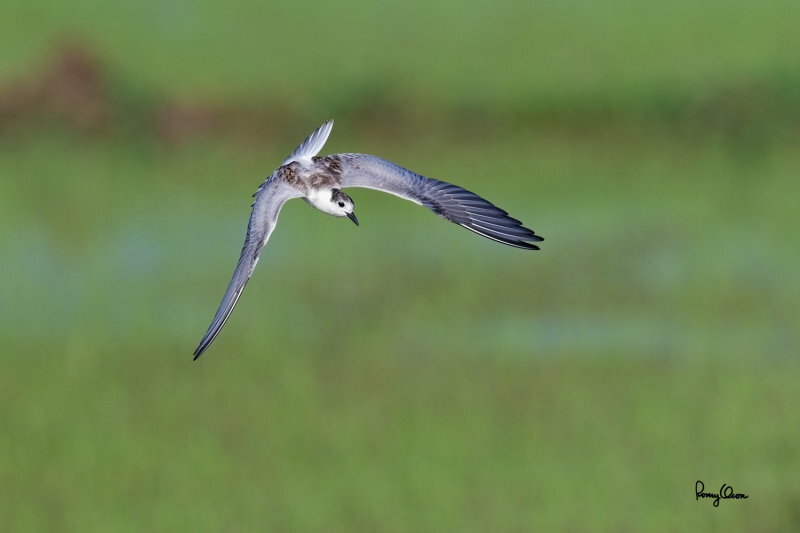 Its habitat includes bays, tidal flats and ricefields. It has a total length of 254 mm and a wingspan of about 635 mm. 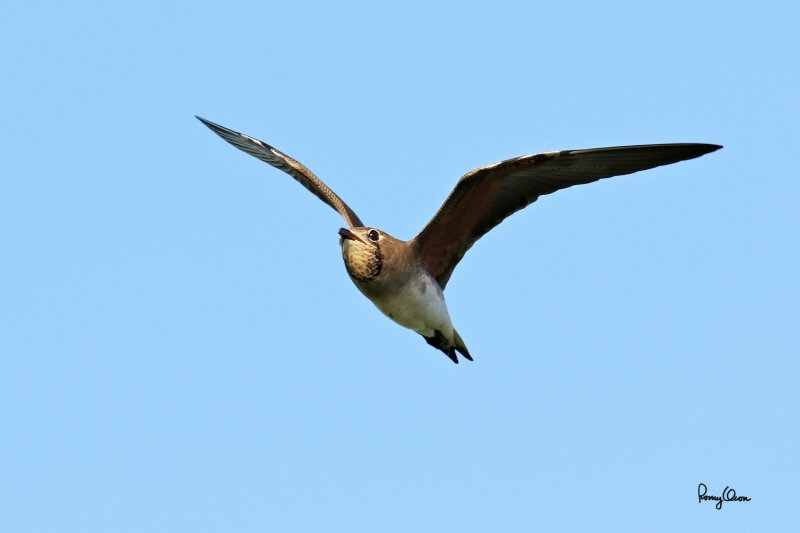 It flies slowly over an area when feeding, hence it's a good candidate for testing the 7D MII's AF under sustained long bursts. The five frames posted here came from a long burst of 28 shots, with over 90% focused critically at the head area. 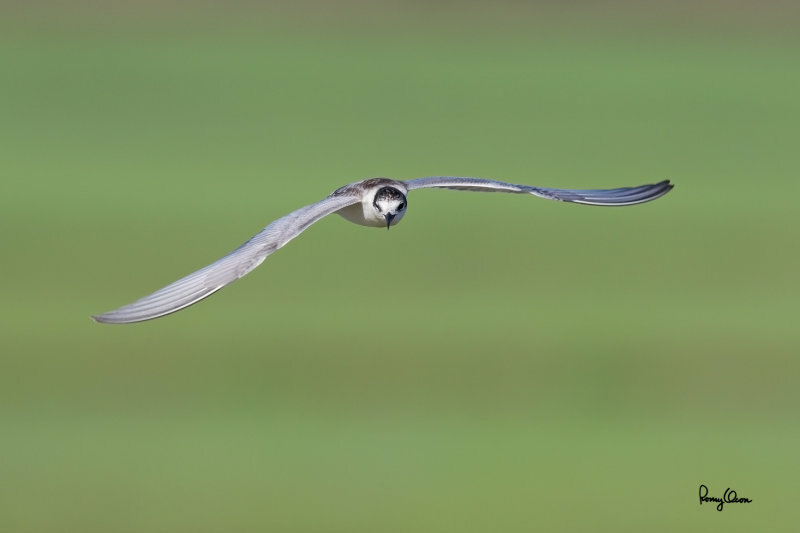 The less than 10% not in perfect focus is most probably a result of my panning clumsiness, as it's tough to frame a bird and follow its flight through 960 mm angle of view. The background are newly planted rice paddies. As usual, you need to click on the larger 1500x1000 versions if you wish to see more detail. Shooting info - Candaba wetlands, Pampanga, Philippines, October 13, 2014, Canon EOS 7D Mark II + EF 600 f4 IS II, f/5.6, ISO 320, 1/2000 sec, manual exposure in available light, 475B/516 support, 3600x2400 (8.64 MP) crops resized to 800x533. More BIF images to come. 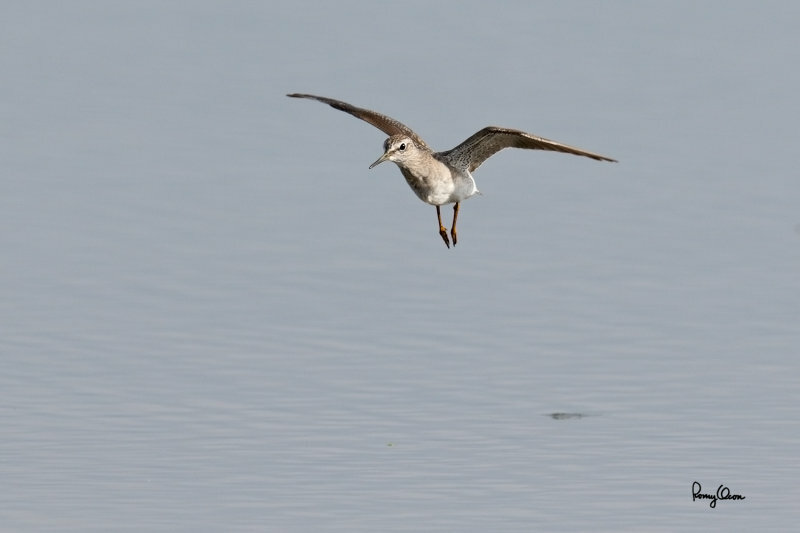 The Wood Sandpiper (Tringa glareola) is a migrant to our islands. 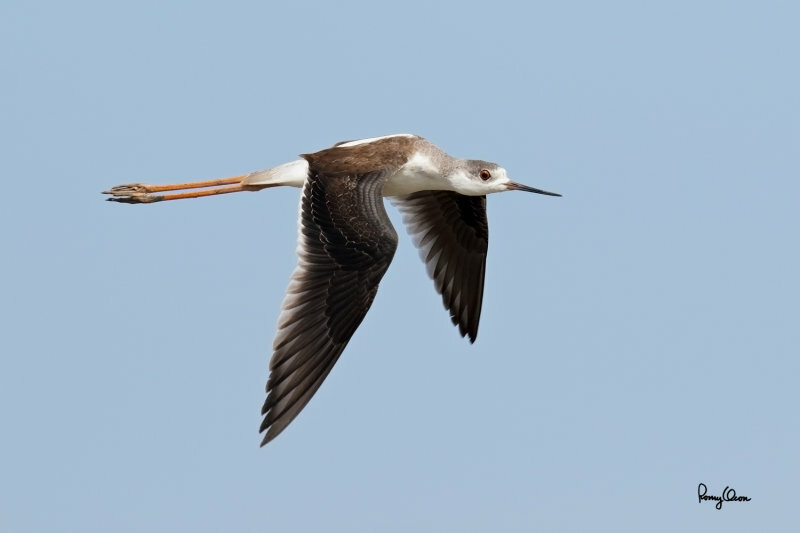 With a total length of 210 mm (8.25 inches), it's not a large water bird. 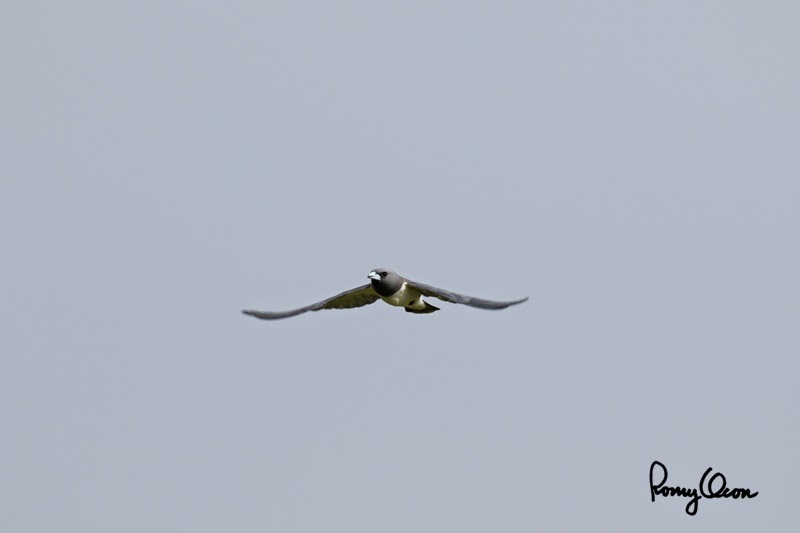 Those who are familiar with the behavior of this species know that it flies very fast and erratically; in fact, I haven't been able to catch one in flight before. Yesterday, I noticed one coming in low over a rice paddy that is being prepared for planting. I swung the 7D MII + 600 f4 IS II combo immediately to try to acquire the BIF. Fortunately, I was able to find it in the VF in a split second, and the camera's AF reacted very fast. That the 7D MII's AF kept up with the incoming, fast BIF impresses me no end. Here's a burst of three shots. 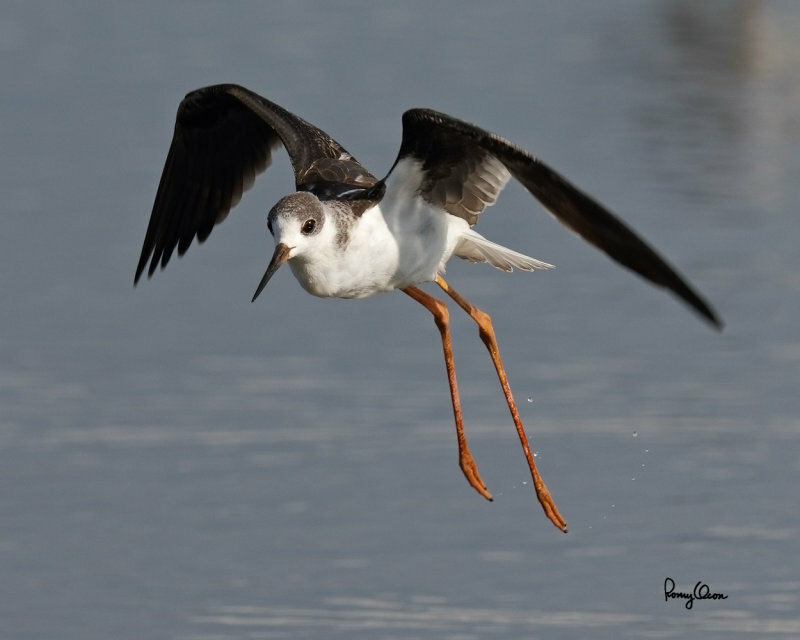 Shooting info - Candaba wetlands, Pampanga, Philippines, October 13, 2014, Canon EOS 7D Mark II + EF 600 f4 IS II, f/5.6, ISO 320, 1/2000 sec, manual exposure in available light, 475B/516 support, 6 MP crops resized to 800x533. Please see the larger 1500x1000 versions for more detail and less resizing artifacts. 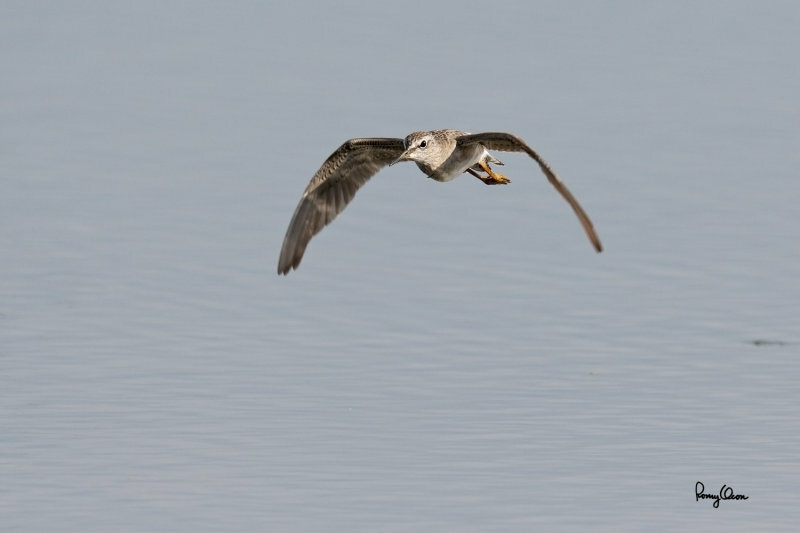 I just got home from two straight days of photographing birds in flight at Candaba wetlands. Though I'm exhausted from the dawn-to-dusk shooting, and driving back through the chaotic traffic of Metro Manila, I thought I'd process and post a few BIFs before retiring to bed. 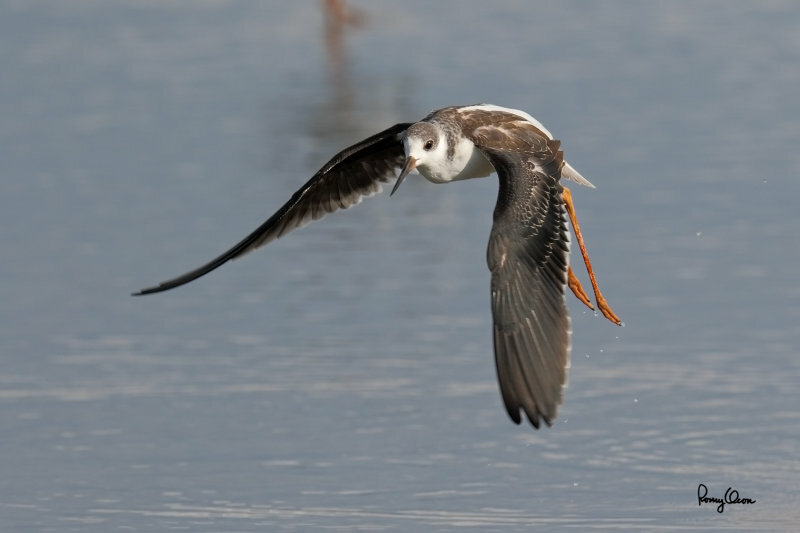 My impression in a nutshell - I've shot hundreds of frames at BIFs in two days, in a wide range of lighting, with sky and terrestrial backgrounds, with varied plumage colors and flight trajectories. IMHO, the 7D Mark II is the best focusing DSLR (in terms of AF speed, focus accuracy and ease of use) I've shot at flying birds. I've not used the 1Dx though, so I'm not sure how the 7D MII's AF compares with that body. But I'd certainly prefer the new camera over my 1D MIV and 5D MIII if my main basis of choice are AF performance and frame rate. With the 7D MII's amazing AF, BIF photography has become much easier for me. Will post more BIF samples from Candaba wetlands tomorrow morning. I visited a fellow birder's farm at Rosario, Batangas (a couple of hours drive south of Manila) to familiarize myself with the camera's AF behavior at BIFs. It rained early in the afternoon, but I was able to get a few bursts in the morning. My initial impression on the AF is very encouraging. I have also tested a pre-prod 7D and 1D MIV way back, and of the three bodies, I'm impressed most at first use by the new 7D MII. The 7D MII's AF is definitely snappier than its older brother. Compared to the 1D MIV, it's too early to say anything definitive on their relative AF performance. But my expectations during testing were much higher on the 1D MIV (it being a top pro body), and that factor perhaps is nudging me towards having a higher "first use" regard for the 7D MII. We'll see how this pans out in the next few days. As regards IQ, the noise at mid-ISOs is noticeably lower than that of my 7D, though I'm not sure yet how it compares to that of my 1D MIV. Here are a few early BIF samples. Note that I'm processing from a laptop screen, and I might have to re-process these when I get back to my calibrated LCD display. 7D MII + 600 f4 L IS II, f/5.6, ISO 320, 1/2000 sec, manual exposure in available light, 475B/516 support, major crop. Uncropped full frame resized to 800x533 - 7D MII + 600 f4 IS II, 1/2000 sec, f/5.6, ISO 320, manual exposure, 475B/516 support. 6 MP crop resized to 800 x 533. 1.92 MP crop processed and resized to 800x600. I hope the weather is better on the second day so I can capture more BIFs. "The pre-production unit is here, you may pick it up right away." Thus read a text message from JayR Romero of Canon Philippines, one I had eagerly anticipated. Since September 30th, I've been waiting for the arrival of a pre-production 7D Mark II in our islands. JayR assured me of a first test shoot with the new camera once it arrives from Hong Kong, but there was some delay in the shipping and it arrived only today (October 10th). 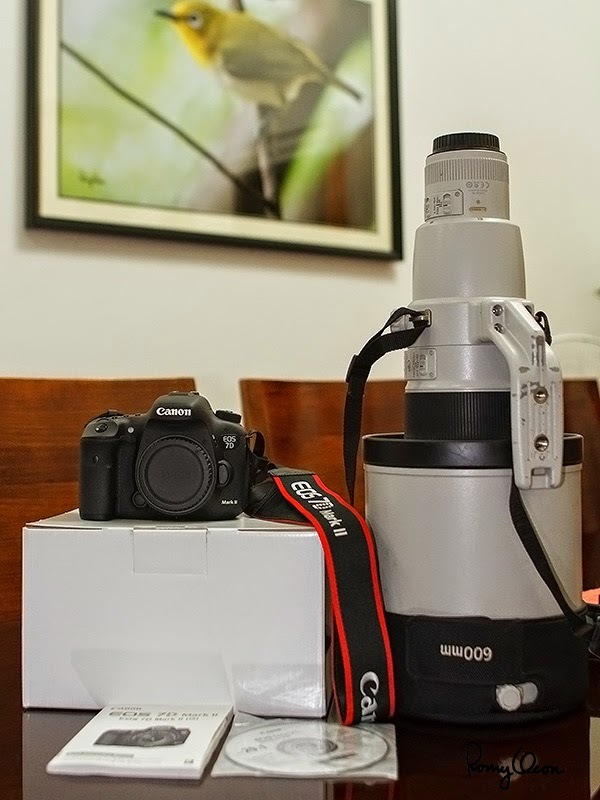 In addition to the pre-production 7D Mark II, I also borrowed a 600 f/4 IS II from Canon Philippines. I'm hesitant to use my dated workhorse lenses (500 f4 IS and 400 2.8 IS) on the new camera, as the older gear might restrain the new body from performing to its potential. It's interesting to note that a 600 f4 IS II + 2x TC (1200 mm f/8) on a 7D MII is a combo with some serious reach, especially with IS and working AF. 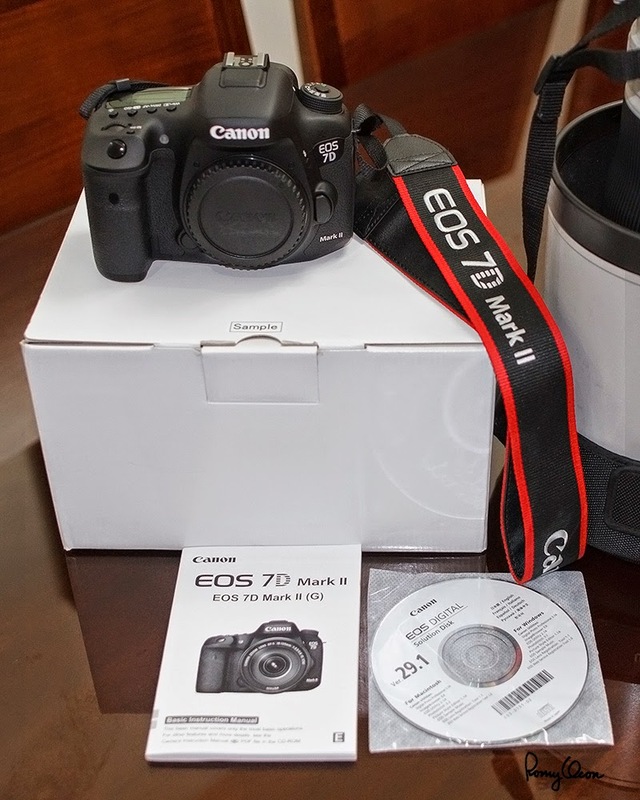 More details and information about the 7D Mark II at Canon USA website. 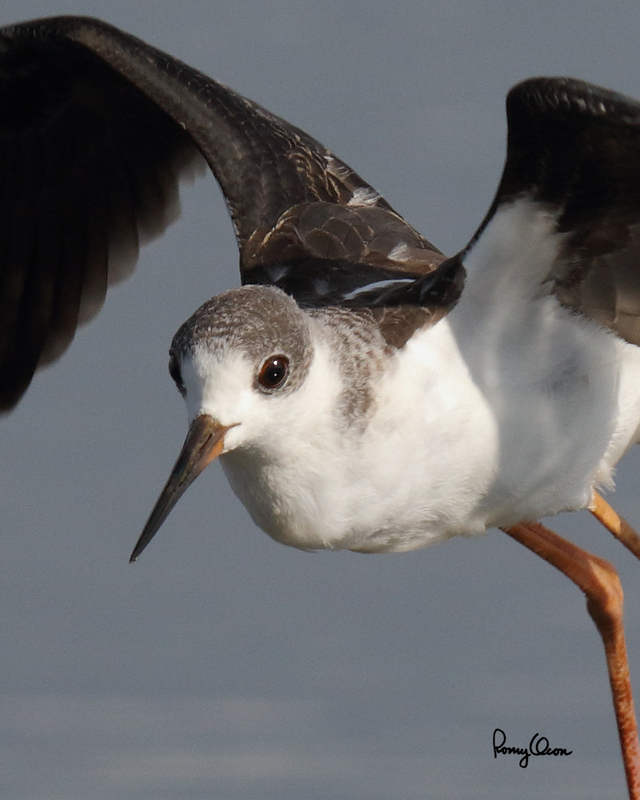 A birding combo with serious reach - Canon EOS 7D Mark II + EF 600 f4 L IS II. A closer look at the pre-production camera - the white box is unmarked, except a sticker that says "SAMPLE." A printed manual, some software disks, as well as some cables and a battery charger are also included. Firstly, I need to check the micro-focus adjustment (MFA) of the 7D II + the series II big white (with and without TCs), while the battery is charging. I want to make sure that AF placement of the combos will be as precise as possible in the field. I'm off tomorrow to bird for several days with the new camera. Wishing for some sweet light (and well groomed feathered creatures) in the field. Will post here my impressions from time to time. it's nice to connect with you again, gayyem romy. where do i see you to give you the two copies of the book? i wish you best always. always exciting and superb shots. "By the way, there's a very interesting behavior of the 7D MII's AI Servo AF at BIFs that makes it different from my 1D4/5D3/7D. When the BG is featured and contrasty, the 7D MII will sometimes focus first on that. But as long as I kept the AF points group on the bird, the AF system shortly refocuses on the intended subject (nearer to the shooter) and keep it there (as long as I do my panning job well). My older BIF cameras were often near hopeless when the BG was more contrasty than the BIF, especially when the bird is very small in the frame". This is a big thing. Like you, I always found that in situations like the one you describe, the supposed ability of the 7D's (and 70D's) AF to recognise, and lock onto, the closer subject, even with a busy BG to distract it, was painfully lacking: if this is working now, the difference for BIFs will be huge. Really helpful of you to point this out!